GPS aka Global Positioning System is a widely used service. Before the year 1984, it was available only to the soldiers fighting for their countries. After a Korean Aircraft crash that killed over 180 people, the US Government decided to provide free access to basic location tracking feature of the GPS technology to prevent losses of life in accidents which can be avoided. GPS is one of the finest technologies invented to date. It has saved millions of lives. With the GPS navigation technology, we can guide ourselves to any given location, trace a person lost in the woods, travel to a distant location without getting lost, etc. Airlines, Shipping firms, car manufacturers employ it in their latest products. Since 2008, the day Google released Android OS, GPS has become an essential feature in mobile devices and smartwatches. Sygic is an offline GPS navigation app with many features. Once the user installs and runs Sygic on their mobile devices, he’ll be asked to download maps for his current location. To help Sygic determine your precise location, you must turn on the data connection and GPS module on your mobile device. Sygic gives you access to 3D and 2D view of maps of Australia, Asia (India), North and South America, New Zealand, Africa, Russia, and the Middle East. Maps available for download are provided by TomTom, a company that specializes in GPS related products. Sygic provides safety features that include live status on police, speed warnings for a special route, and more. It lets users find the shortest route to a specific location. It helps users find gas stations that provide discounts on fuel purchases. Sygic has a user-friendly UI and it provides intuitive navigation controls. It has several interesting features that hikers, frequent travelers, drivers, etc will find useful. Sygic is one of the top GPS navigation apps for 2019. Option to download maps for offline use. Waze is a powerful GPS application that allows you to dodge congested roads and reach your destination quickly by recommending the shortest routes. 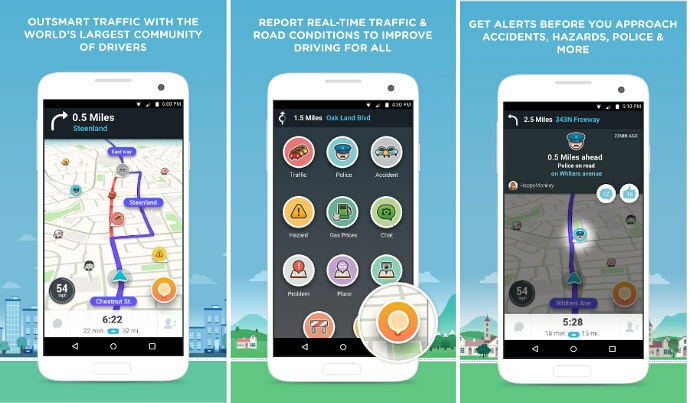 It lets users share traffic details with other Waze users. The app shares the status shared by one user with users driving on the same road or heading to the same destination. The status may include information on an accident, police trap, mishap, divert, etc. Waze enables users to share information on a local place or business they’ve found interesting. It saves the routes the user is frequently taking and saves time by showing the shortest paths to the destination. It works only when you activate data connection and GPS on your mobile device. Waze is one of the most downloaded GPS apps of all times. It has 100 MN active installations. Remembers vital information of users. Works great on slow connections. GMaps come pre-installed with all Android devices. If you’ve ignored this app or have removed it from your device, you may have done a mistake. Open the app on your phone or tablet and enable GPS and WiFi or data connection. You’ll now see a world map. Tap the round button above the blue button to make Google Maps locate you on the map. You can also zoom the map to locate yourself manually. If you use the Google search engine often, then Google may know your location already. So, you can skip the above task. Like Sygic and Waze, GMaps provides a function to find alternative and smaller routes to a particular destination. To use the feature mentioned above, tap on the blue circular button and enter your target location. 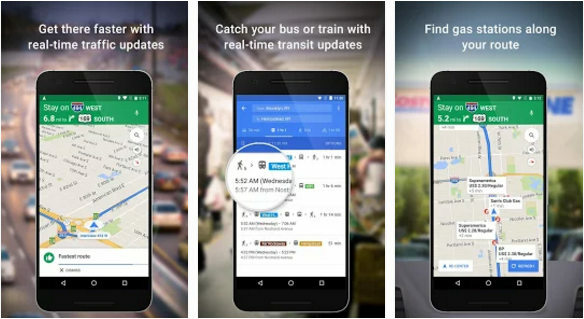 Google maps GPS app allows users to find nearby top-rated businesses, restaurants, coffee shops, stations, hotels, etc. It shows ratings and reviews on your favorite nearby businesses. The GMaps application enables users to download maps of their region to their mobile device. After downloading the maps, you can access them offline. GMaps is an accurate application trusted and downloaded by 1 billion users. 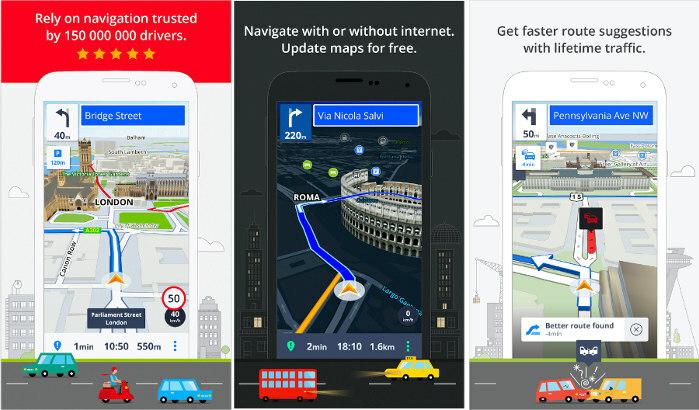 It is one of the best GPS apps for mobile phones and tablets. Information displayed by the app is accurate. Premium features free of cost. Determines users location based on Google search history. Works in offline mode if you download maps. Conclusion: GPS is an important feature of mobile phones. To make proper use of it, users must install and use one of the navigation apps we have covered above.